Dharmik Vidhi & Shraads Expense Will Done By Tourist Self-Expense Only. From Third Day Morning Tea To Eighth Day Morning Tea: Food, Breakfast, Tea Will Provide By Company. In This Tour At All Places A/C Rooms Are Available. Reached Allahabad. Stay At Allahabad. Morning There Will Be Religious Ceremony And In Afternoon City Darshan Of Allahabad. Stay At Allahabad. Allahabad - Beautiful Places: Triveni Sangam (Ganga, Yamuna, Saraswati), Slept Hanuman, Akshay Wat (Fort), Bhardwaj Ashram, Anand Bhavan (Nehru Grah) & Hanuman Niketan. Dharmik Vidhi - Triveni Net, Shaur & Sachel Mantra Snan, Chatshrad, Venidan, Saubhagya Vayandan & Setu Visarjan ( Triveni Sangam Boat Travel ). Travel From Allahabad To Ayodhya. Ayodhya Darshan. Stay At Varanasi. Ayodhya: Birth Place Of Lord Ram, Hanumangadi & Sharayu River. Morning Varansi, Dharmik Vidhi & Afternoon Sight Scene. Visit Saarnath. Stay At Varanasi. Beautiful Places: Ganga River (Ganga Snan), Kashi Vishveshwar Temple, Kalbhairav Temple, Tulsi Manas Temple & Birla Temple. Aniwarya Dharmik Vidhi: Ganga Bhet (Kshetra Sanman), Tarpan Tirth, Shraad Or Together 12 Chatshraade. Devkarya: Abhishek (Maharudra, Laghu Rudra), Kashi Vishweshwars Sahastrabel, Annapurna Kunkumarzan, Saubhagya Vayandhan. (1Hour Boating In Ganga). Including In This Harishchandra Ghat To Ashvamedh Ghat Atleast 25 Ghat Are Use To Shown. (Company Expense). Saarnath: Stuph, Sihanstambshirsh (Our Country Money). Morning Is Left For Shopping Or Rest. In Afternoon Proceed To Gaya From Varanasi By Train. Morning Dharmik Vidhi. Afternoon Visit Budhgaya. Stay At Gaya. Gaya (Budhgaya): Here There Is Two Division, Where There Is Vishnu Pad And Lord Vishnu Killed Gayasur. So The Place Is Called ‘gaya’. 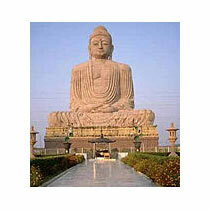 Where Lord Budh Got Knowledge That Place Is 13Km Faraway From Here, It Is Also Called Bodhigaya. This Two Place Will Be Shown. Dharmik Vidhi: Vishnupad Chatshraad, Akshaywat Chatshraad & Vishnu Sahashratulsi Puja. Beautiful Places: Vishnupad Temple, Phalgu River, Bodhigaya, Tibet, Japan & Switzerland Temple. Early Morning Leave From Gaya By Train.